Harlequin editors read a lot of romance books. Sometimes a scene idea or plot twist that seems fresh to a new author is actually one we’ve read many times. And that’s not surprising. When starting a new creative venture, it’s natural to emulate artists whom you admire, including aspects of their “voice” – word choice, character types and situations. On top of that, you’re writing category romance, with a mighty list of reader expectations built in. As with so much else in fiction writing, thoughtful character motivation is at the heart of making your scenes feel fresh. Even the most familiar story ideas and situations can feel new in the hands of an author who has thought long and hard about how her characters react to conflict and why they do what they do. What are some romance plot or scene clichés that you’re tired of seeing? Join the conversation in the comments! And join us here on Wednesday, January 23, 2019 for a fresh post from a bestselling Harlequin author! 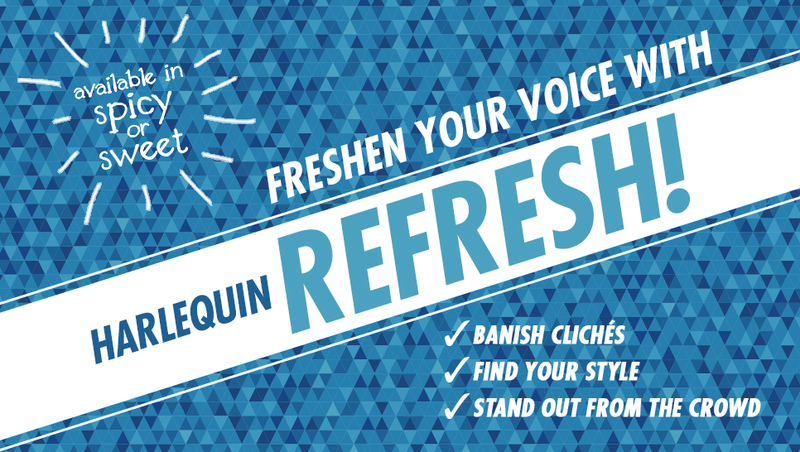 Harlequin REFRESH: Perk Up Point of View! Babies as cute luggage which get parked with a convenient babysitter for 99 per cent of the story. I understand readers want a fantasy and the focus must be on the growing romance. way to grow and convey growth of a relationship and the people in it. Please don’t put a cute baby on the cover just to get me to buy the book. I won’t give you a bad review…but only because I won’t finish reading it. Thank you for this subject. When you read what editors are looking for, it can seem very constricted. This opens up a lot of possibilities!